Everyone wants to look beautiful, however, there is always a cost associated with it right? Wrong! With so many wonderful ingredients readily available in your kitchen, there is no reason to look for cosmetic products to get that wonderful glow. 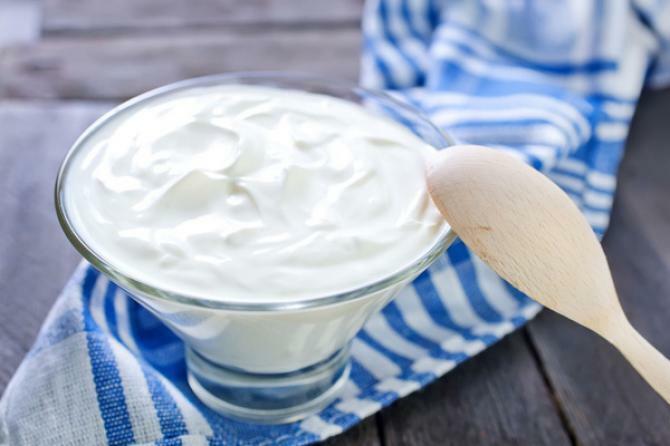 Yoghurt is one such amazing ingredient that can be used for a variety of reasons. 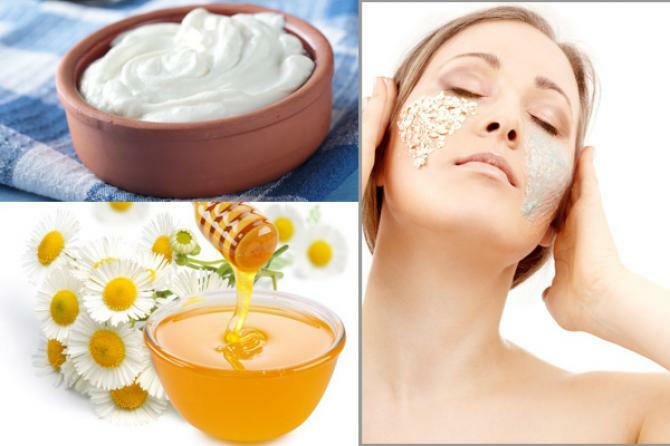 If you are looking forward to flaunt a glowing, healthy and head-turning clean and clear face this wedding season, here are some fantastic DIY yoghurt face packs for you. Before we move to face masks that would bless your skin with goodness of another amazing ingredient along with yoghurt, try a simple yoghurt face mask as well. Yoghurt contains amazingly high levels of lactic acids that are good for your skin. It has plenty of vitamins and minerals that work to keep your skin nourished and hydrated. It also has antimicrobial properties, which make it an ideal natural remedy for those with skin breakout problems. Just gently massage some thick yoghurt on your face for 10 minutes before rinsing it off. This will help you get rid of dead skin cells, and will also smoothen out the fine lines. It will also hydrate your dry skin and tighten skin pores. And, best of all, it will give your face a healthy glow. 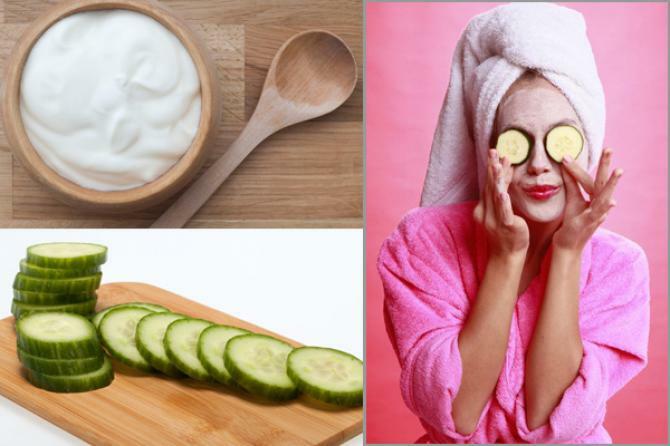 There can be nothing more refreshing or hydrating for your skin than a cucumber and yoghurt face pack. 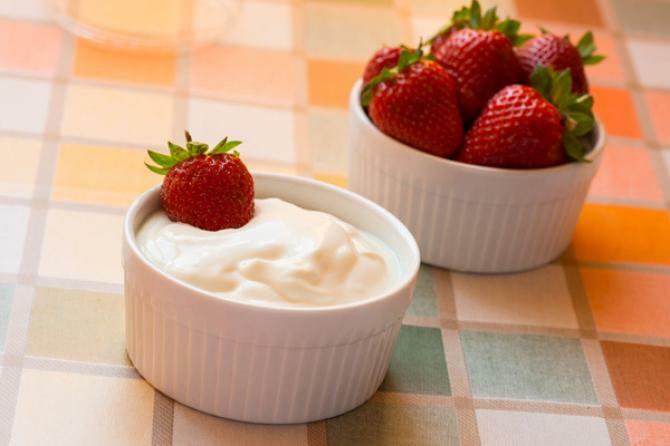 Lactic acid in yoghurt will also help to exfoliate your skin, apart from fighting pimples and relieving skin tan. It is a very simple pack that can be prepared by mixing together freshly grated cucumber with yoghurt. Now, apply this on your face and leave it on for 15-20 minutes before rinsing it off with cold water. Take it a notch higher by placing two slices of cucumber on the eyes as well! This face pack is great for all skin types. It is a fantastic way to moisturise your skin while exfoliating the dead skin cells. What’s more? This pack is great for those who love to flaunt clear and spotless skin. Mix equal quantities of finely grounded oatmeal and yoghurt, and add a few drops of honey into it. Apply this mix on clean face and allow it to dry. Wash off after 15 minutes, and splash cold water to close the open pores. 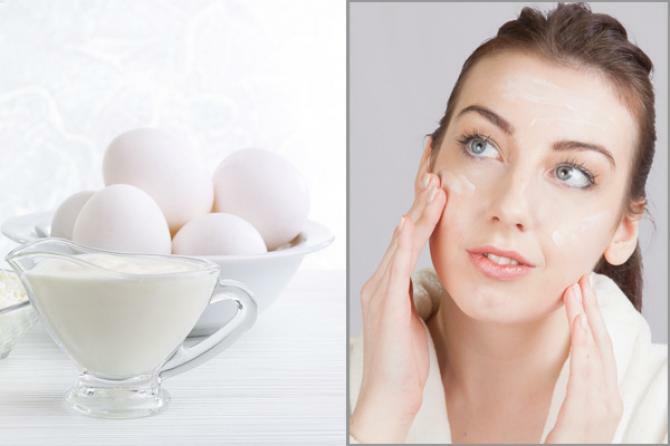 Egg whites are not just good for your body, but for your skin as well. Eggs are rich in vitamins and minerals that are amazing for skin. Combine egg whites with the goodness of yoghurt and you get a beauty recipe for keeps. Mix together one egg white and some yoghurt. Make a smooth paste to apply on the face. Wash it off after 15-20 minutes. Do apply a moisturiser afterwards. While the ingredients sound delightfully yummy, they are for application on the face and not for eating! This pack is a fantastic way to brighten your skin while also getting a clean complexion. Instantly brighten up your skin by mixing together two mashed ripe strawberries, a teaspoon of honey and a teaspoon of yoghurt. Now apply this paste on your face, and allow it to rest for 15-20 minutes. Use warm water to scrub the mask off, and apply a natural moisturiser on your face. Here is another mask that combines the moisturising properties of yoghurt and honey with the skin brightening qualities of tomatoes. This face pack is great for all skin types. 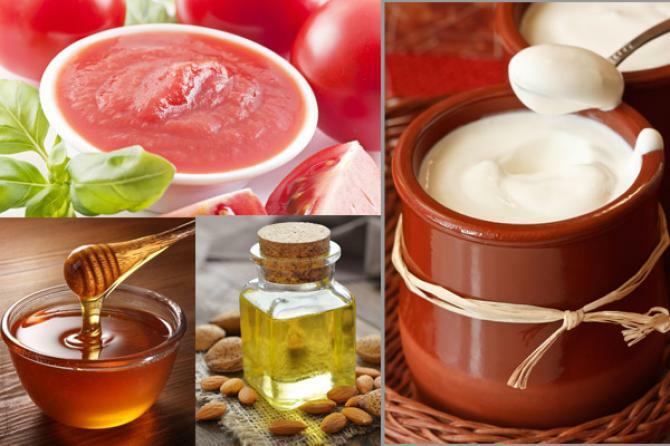 Prepare a paste by mixing one tomato pulp with a teaspoon of honey and yoghurt. Apply this paste on your face and allow it to rest for 15-20 minutes. You can also add a teaspoon of almond oil instead of honey. Almond oil, which is rich in vitamins will provide your skin with a healthy glow. For dry or flaky skin, this face pack can seem to be a boon. 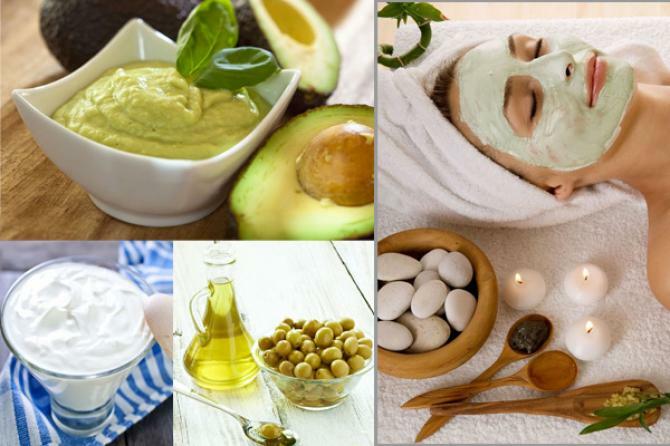 The moisturising properties of avocado and olive oil will deeply nourish the skin while yoghurt will revitalise the dry skin. Take half an avocado and mash it. Add a teaspoon of olive oil and yoghurt each into the mashed avocado. Now, apply this on your face and allow it to stay for 10-15 minutes. Wash it off to reveal bright and smooth skin. Apples are rich in skin-friendly vitamins, and it also helps to exfoliate your skin. It would work wonders if you combine it with skin soothing properties of honey and nourishing goodness of yoghurt. Take an apple, peel it and grate it. Now, add a tablespoon of yoghurt and honey each to it. Now, apply this on your face and allow it to dry before rinsing it off. Using this pack frequently will result in the skin becoming smoother and brighter. You can use a green apple for this face mask as well. Here is a revitalising, moisturising, cleansing and smoothening face mask for all skin types. 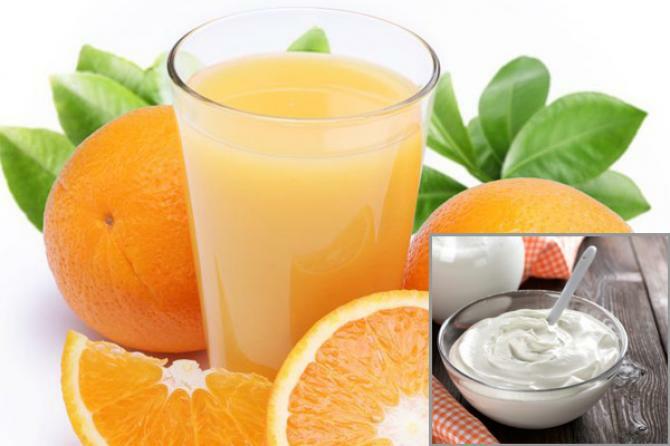 Add the goodness of orange to yoghurt, and make it a part of your beauty routine. Mix some orange juice with yoghurt, and apply that on your face. Keep it on for 10-15 minutes before rinsing it off with lukewarm water. 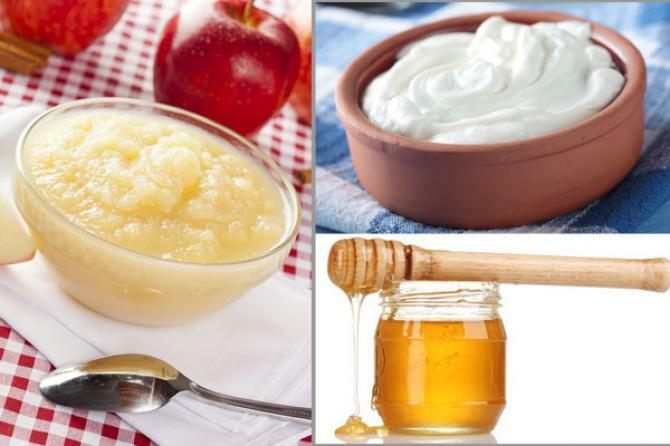 You can also add honey to this mask if you have dry or tanned skin. It is impossible to leave behind mangoes that are known for their deep nourishment. Mango is rich in a number of amazing vitamins and antioxidants that can do wonders for your skin, including fighting signs of skin ageing. 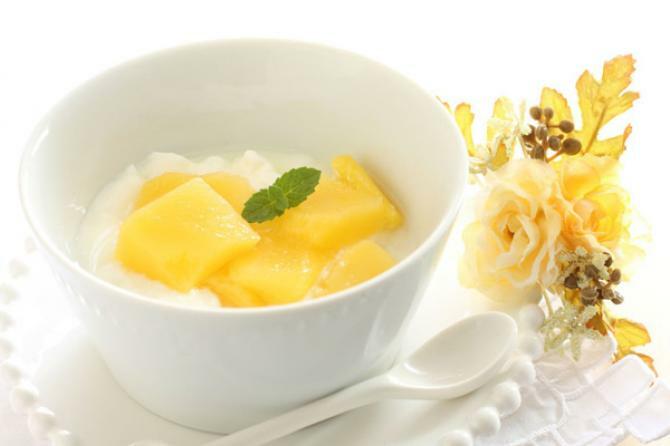 Mix together 2-3 tablespoon of yoghurt with half a ripe mango pulp to make a smooth paste. The two ingredients will work to give a nourished and brighter complexion. If you are looking for an absolute beauty nirvana for your face, then this one is for you. Put together these ingredients, and you get a face mask that gives you a bright, glowing, fair and clean skin while preventing pimples and erasing signs of ageing. 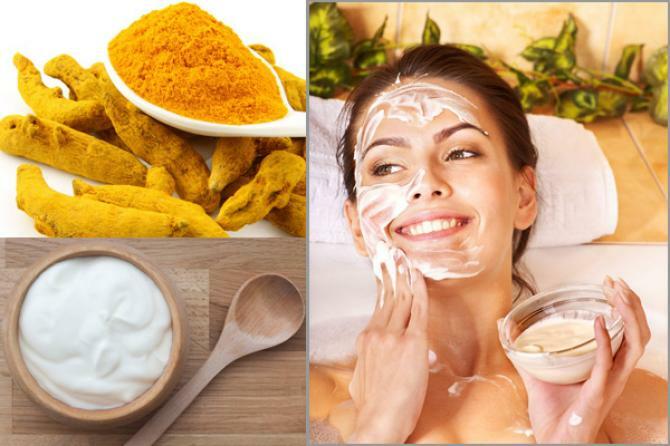 Take a tablespoon of turmeric and mix it with three tablespoons of yoghurt. Apply this on your face and wash it off after 15 minutes. You can also add honey into this pack for a smoother skin.